She is the founder of Tostan, a Non-Governmental Organization (NGO) headquartered in Dakar, Senegal whose mission it is to empower African communities to bring about sustainable development and positive social transformation based on the respect of human rights. None. Author is not a full-time writer. Molly Melching is the Founder and Executive Director, Tostan. Education and health issues and how they are addressed by NGO workers on the ground in Senegal, Mali…. It was a very inspiring story. What an incredible life Molly has led! I was very pleased to see that the author has mingled, at one point, with some very important people in Senegal: among others the late Ousmane Sembéne , our beloved film maker, and the late Cheikh Anta Diop, our one and only national hero, professor Egyptologist and anthropologist… Ms Melching has spent the last 40 years in Senegal. 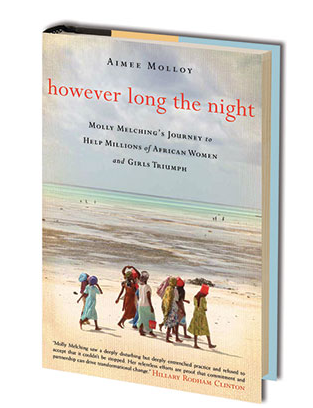 She is perfectly fluent in Wolof and her daughter was raised almost like a Senegalese child. I believe that is why she was able to effectively have an impact on the ground. People truly saw her as one of them. And it had definitely made a difference. Whenever, I read this kind of book, I always feel sad about the whole thing. It’s true that the story was inspiring, but how I wish this story was that of a person of Senegalese decent. I know I sound racist. But somehow, it seems, at least to me, that only white people sacrifice their lives to help African people or poor people. All things being equal, being poor does not necessarily go hand in hand with being an African. The truth is that some Africans do it. Precolonial Africa was built on a community type of society as oppose to an individualist society. We are humans after all, and the people who need help are our very own kinsmen. The reality must be that we don’t know these people, they are not famous, they don’t have any contacts nor do they have access to the media or the Internet for that matter. That is very unfortunate for them, they deserve to be recognized. They deserve to be celebrated, so that others can be inspired to do the same. Inspiration, admiration and sadness, not necessarily in that order. You will be inspired by her story. However, I believe it should also inspire the reader to do his/her part in the fight against poverty in Africa (or elsewhere). We all have a part to play in this global challenge. The more people commit to it, the more the issues will get solved sooner rather than later.